With five seasons of scoring 50 goals or more, Brett Hull also secured over 100 points in four of those seasons, with each occurring during his successful time with the St Louis Blues. 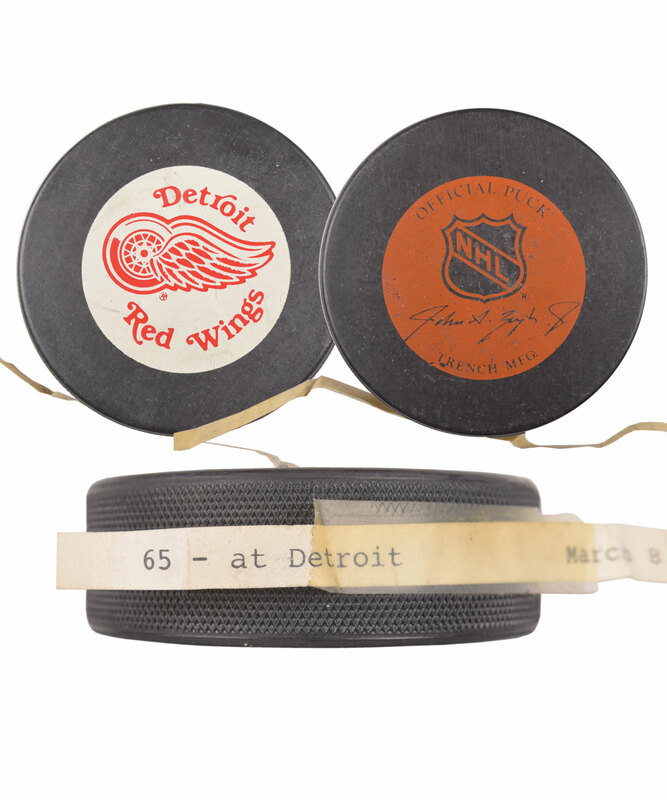 We have an important puck from Hull’s collection, with the example he used to score his 65th goal of the 1989-90 season. Taking place in a March 8th contest against Detroit, the official Trench Red Wings puck has a thin mostly-detached label, with typed particulars including “65 – at Detroit March 8, 1990”. A signed LOA from Brett Hull will accompany. The puck feature’s clean Trench and Red Wings logos, with just light overall wear. The label along the side has become mostly detached, with just the central portion remaining affixed by way of clear tape. Hull would conclude the 1989-90 campaign with 113 regular season points, including 72 goals, with his 65th scored serving as his 139th regular season career goal.